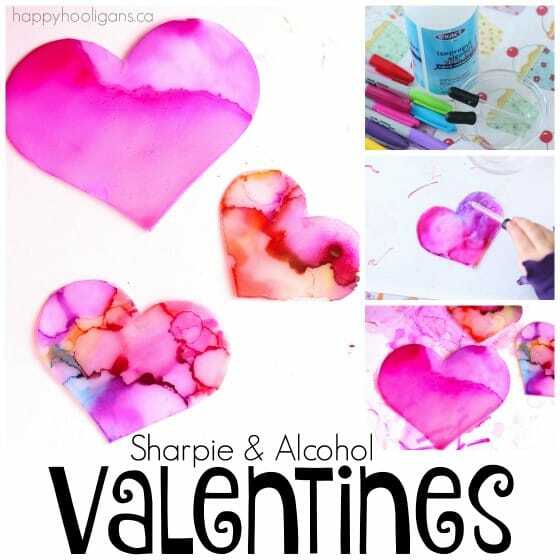 We’re making Sharpie and Alcohol Valentines ornaments today, using one of our favourite art techniques. 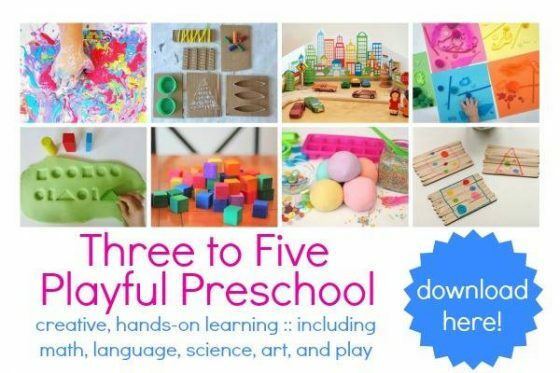 Kids of all ages love this fascinating process. It’s a bit like tie dye, but a lot quicker and easier! 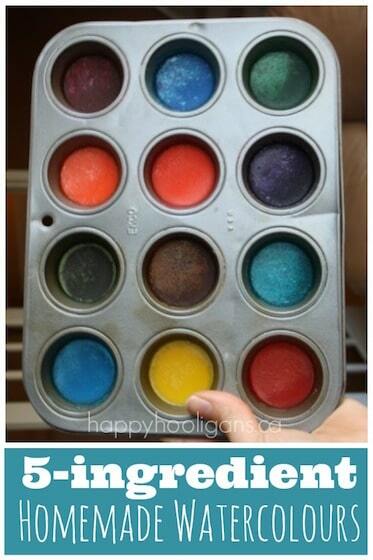 This vibrant art process can double as a science activity, and it’s one of our favourites here in my home daycare. For starters, it’s very simple; it only requires two substances: Sharpie markers and rubbing alcohol. 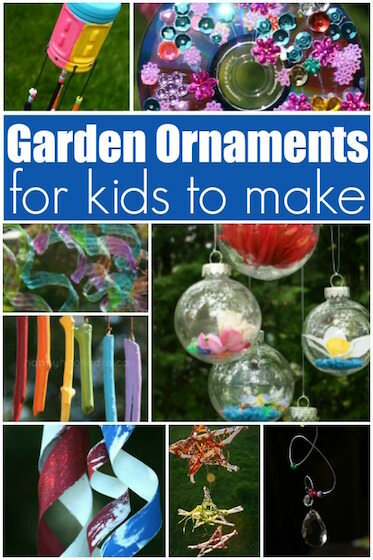 Secondly, kids can make a variety of different crafts using this process. We’ve made homemade bookmarks to give as gifts and various ornaments for different holidays. And lastly, this experiment fascinates us every single time. 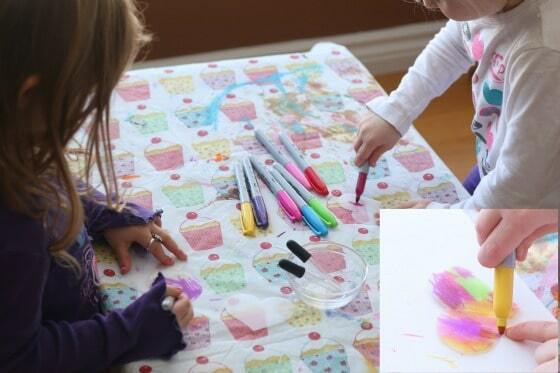 Even the big kids love the tie dye effect that you get when you drip rubbing alcohol onto Sharpie ink. 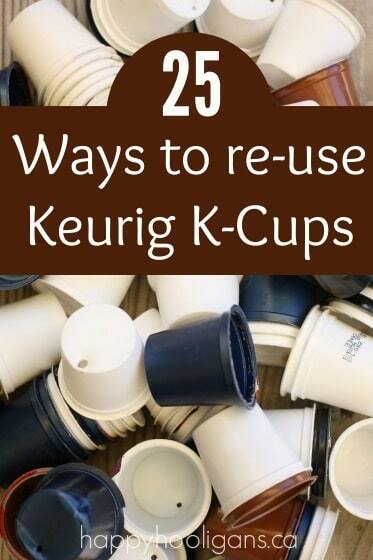 To start, you’ll need a piece of opaque plastic (like a milk jug) to cut your hearts out of. Here in Canada, milk jugs are hard to come by, so we use a vinegar jug. 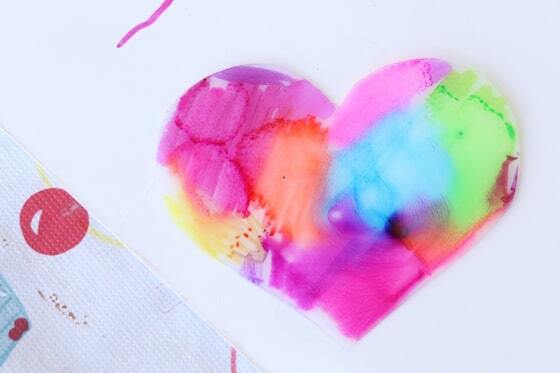 Using your stencil and pencil, trace some hearts onto the flat surface of the jug. Cut out our hearts, and wash and dry them to remove any possible residue. 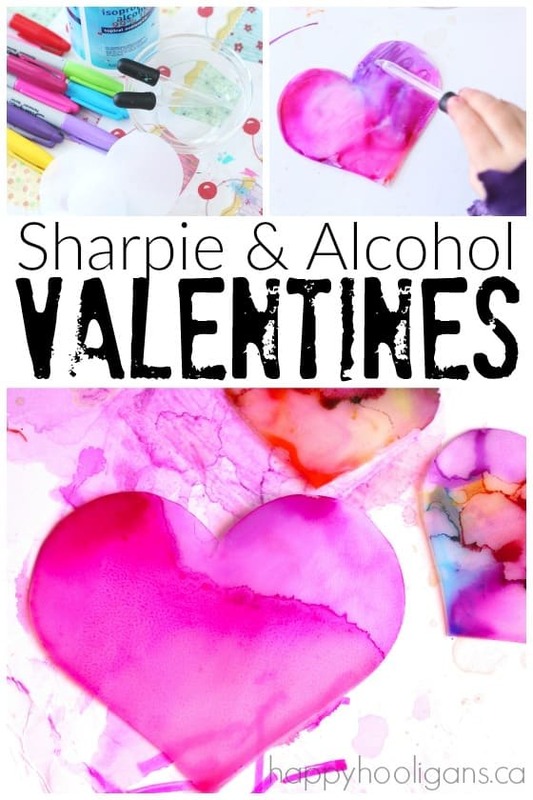 Now, have your kids colour their hearts with the Sharpies. Bright and/or dark colours work best. 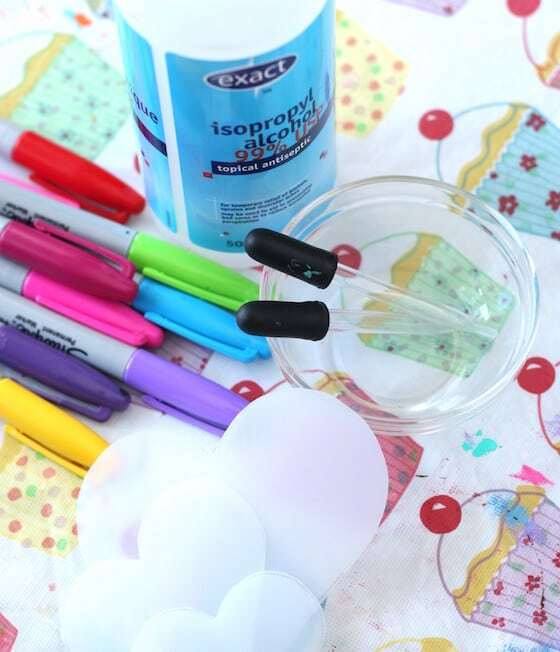 Protect your work surface if you don’t want to risk the permanent ink or rubbing alcohol damaging it. 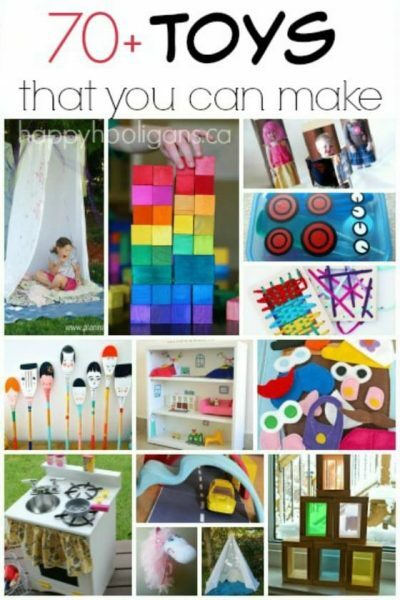 Have your child colour their hearts with a variety of Sharpies. the colouring doesn’t need to be neat and tidy, and you don’t have to completely cover the heart. Scribbles are fine. Just get some colour all over those hearts. I like to stick with similar and complimentary shades for this project because it prevents your hearts from turning brown when the colours mix. Blues and reds work nicely together, as do greens and blues and yellows. 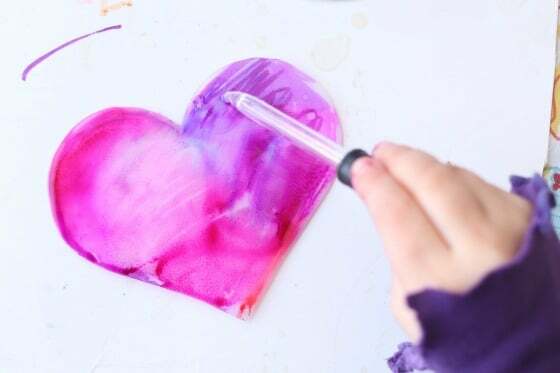 Once your child has his or her heart coloured in, it’s time to add the rubbing alcohol to create the chemical reaction. As mentioned earlier, you need 99% rubbing alcohol for this experiment to work. 60 or 70% alcohol is not strong enough to create a reaction. 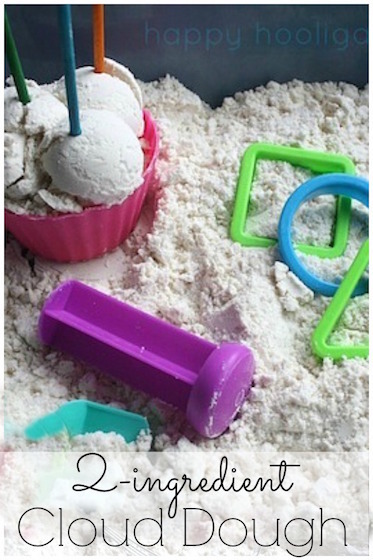 Have your child dip a medicine dropper into the rubbing alcohol, and then tap or drip the alcohol onto the heart. Watch as the colours come to life, and expand and blur together! Go easy with the amount of alcohol you use to prevent the colours from being washed out and running off the edge of the hearts. If this happens, you can wipe your heart clean and start again. Look at the effect that the alcohol has on the Sharpie ink! To protect the colours from being scratched off of your hearts, you can give them a light spritz with poly-urethane varnish. You’ll need to use a spray, as the liquid varnish will wash the Sharpie ink away. Spritz lightly to prevent the colours from activating and blurring further. I’m not sure how we’ll use our colourful hearts. 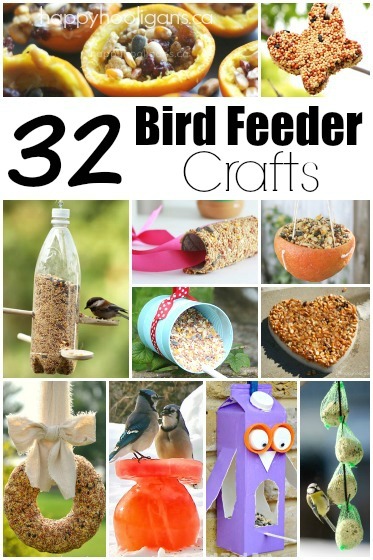 We may glue them to cards or punch holes in them, and thread them for hanging. 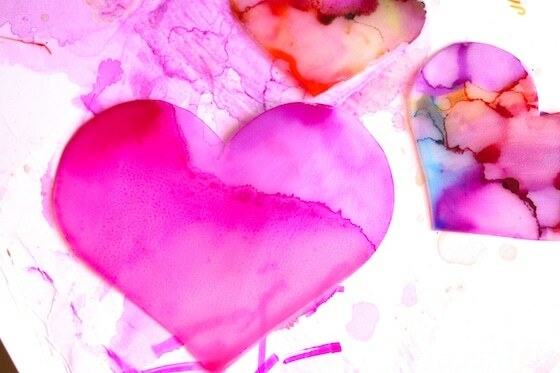 Let me know if you try this experiment at home, and tell me how you used your beautiful Valentines hearts! You’re welcome, Jessica! Have fun with them!